Francis Joseph Tripucka (December 8, 1927 – September 12, 2013), known as Frank Tripucka, was an American collegiate and professional football quarterback, at Notre Dame, in the National Football League, in the Canadian Football League, and in the early American Football League. Originally from Bloomfield, New Jersey, Tripucka (truh-PEW-kuh) graduated from Bloomfield High School in 1945. Tripucka was backup quarterback to Heisman Trophy winner Johnny Lujack on Frank Leahy's unbeaten Notre Dame squads in 1946 and 1947. When Lujack graduated, Tripucka became the 1948 starter. He led the team to a 9-0-1 record, their only blemish being a 14-14 tie with USC in the last game of the season. Notre Dame finished #2 in the final polls and Tripucka was named an All American. A three-time letter-winner at Notre Dame, the 6-2, 172-pound Tripucka completed 53 of 91 throws as a senior for 660 yards and 11 touchdowns. He played in the College All-Star Game following that season. His 11 TD throws that year set a Notre Dame single-season record. As a junior in ’47 he connected on 25 of 44 throws for 422 yards (three TDs, one interception) on the Irish national championship squad. In 1946 as a sophomore he hit one of his five throws for 19 yards and as a freshman in 1945 completed his only pass for 19 yards (and carried twice for eight yards). His career totals featured 80-of-141 passing for 1,122 yards and 14 TDs with only one interception. Tripucka's final three Notre Dame teams featured a combined 26-0-2 mark and consensus national titles in 1946 and 1947. His senior season in 1948 saw the Irish move into the number-one slot in the Associated Press poll two games into the season, as Notre Dame posted a 12-7 win over eighth-rated Northwestern and finished the season tying USC 14-14. The Irish finished second in the final AP poll that year behind unbeaten Michigan. Tripucka ranked as the first quarterback in Denver history and the Broncos retired his number 18 jersey (until it was offered to Peyton Manning). He was one of the four original selections to the Bronco Ring of Honor in 1984. His top year in Denver came in 1960 when he completed 248 of 478 passes for 3,038 yards and 24 TDs. He threw for 477 yards in one 1962 game against Buffalo. He completed the first TD throw in American Football League history in 1960 and became a 1962 AFL All-Star pick. When Tripucka graduated, the Philadelphia Eagles drafted him with their first round pick in the 1949 NFL Draft, but traded him to the Detroit Lions before the 1949 season began. He started with the Lions in 1949, and then played the next three seasons with the Chicago Cardinals. 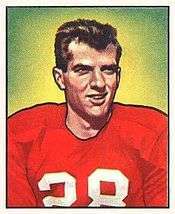 In 1953 Tripucka moved to Canada to play with the Saskatchewan Roughriders. The 'Riders had just hired Frank Filchock as coach, and Tripucka joined him as the starting quarterback. He played there through 1958, when he was traded to the Ottawa Rough Riders, but he was back in Saskatchewan before the end of the 1959 season as coach. The Roughriders were having a dismal season. Non-Canadians playing Canadian professional football were known as imports. In 1959 each Canadian Football League team was limited to 12 imports. Coach Tripucka was ineligible to play because the Roughriders already had these 12 roster spots filled. However, in the fourteenth game of the season, all three Roughrider quarterbacks were sidelined by injuries. For the last two games, management decided to play Tripucka anyway. Because of the ineligible player, these two games were forfeit in advance. The Roughriders lost the first of them on the scoreboard as well, 20-19 versus the Edmonton Eskimos. In the last game of the season, versus Bud Grant's Winnipeg Blue Bombers, Tripucka had 17 completions in 29 passes and Ferdy Burket ran for five touchdowns. At the end of the game the Roughriders led 37 to 30. The final, official score was Saskatchewan 37, Winnipeg 30 for a Winnipeg victory. Tripucka played seven seasons in Canada. The American Football League was founded in 1960, and Tripucka's old coach at Saskatchewan, Frank Filchock, was hired as the first coach of the new league's Denver Broncos. He brought Tripucka with him as an assistant coach. However the Broncos also had quarterback problems, and in preseason Filchock sent Tripucka in as a player. He became their first starting quarterback in the regular season and played with the team for four seasons. He was the first U.S. pro quarterback to throw for 3,000 yards in a season and a 59-yard pass to Al Carmichael was the first touchdown pass in the history of the AFL. In 1962 he was named to the AFL All Star team. Tripucka retired in 1963 after 15 professional seasons. The Broncos subsequently retired his #18 jersey. In 1986, Tripucka was one of three players to be inducted into the Denver Broncos Ring of Fame. On March 9, 2012, Tripucka stated that he would allow #18 to be worn again by Peyton Manning if the Broncos were to sign him. On March 20, 2012, at a press conference announcing his signing by the Broncos, John Elway thanked Tripucka "for allowing the franchise to unretire the number for Manning." On March 7, 2016, the #18 jersey returned to retirement when Manning announced that he is retiring after 18 professional seasons (4 seasons with the Broncos). He is the father of former Notre Dame and Detroit Piston basketball star Kelly Tripucka who also played for the Utah Jazz and the Charlotte Hornets. He is also the grandfather of football players Shane Tripucka and Travis Tripucka as well as professional lacrosse player Jake Tripucka. Tripucka died of congestive heart failure on September 12, 2013, at his home in Woodland Park, New Jersey, aged 85. In 1997, Tripucka was inducted into the National Polish-American Sports Hall of Fame. Frank's nephew Liam Carr, also became a legend in his own right on the golf course. ↑ Peyton Manning was permitted use of the number during his tenure with the Broncos by Frank Tripucka. The number likely will remain retired from here on out. 1 2 Profile, polishsportshof.com; accessed December 28, 2015. 1 2 Frankel, Jeff. "Funeral set for Broncos quarterback Tripucka, formerly of Bloomfield", Bloomfield Life, September 13, 2013; accessed September 15, 2013. "Funeral plans are set for Frank Tripucka, the Denver Broncos' first quarterback. He was a Bloomfield native.... Tripucka, 85, a 1945 Bloomfield High School graduate, died Thursday at his Woodland Park home. His son, Kelly Tripucka, a former Notre Dame basketball standout, said his father died of congestive heart failure." ↑ "Manning Introduced as Broncos QB". Fox Sports. 2012-03-20. Retrieved 2012-03-20. ↑ "Peyton Manning retires from football after 18 NFL seasons". The Denver Post. 2016-03-06. Retrieved 2012-03-07. ↑ Frank Tripucka dies at age 85, espn.go.com; accessed December 28, 2015.